The Wayforward developed DuckTales Remastered was released last month as a digital download becoming a hit despite a divided critical reception. Many fans loved the presentation and gameplay but there was a vocal group who seemed to have an issue with the game's pacing and use of cutscenes. In the end, the game is a loving tribute to both the NES classic and the TV series it's based on. With the video game collector market becoming an increasing force against the digital market, publishers have taken note and we are beginning to see games that have proven themselves as a downloadable game get a physical retail disc release. 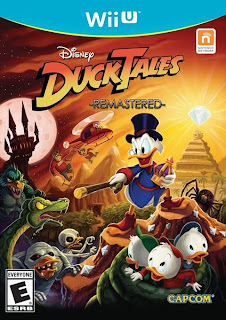 This trend is not lost on the struggling Capcom resulting in the announcement of a retail version of DuckTales Remastered. While bonus material has not been announced for the retail disc, Capcom has given a November 12th release date and a price of $19.99. This is great news for Gamer's (myself included) who prefer to actually own their games and not leave that ownership to the publishers discretion. What are your thoughts on retail vs. digital? Please comment below.